INTERVIEW: JUNNYAN @ Anime Expo 2015 | VKH Press – J-Rock & Visual Kei Coverage Worldwide! VKH Press had the pleasure of sitting with fashionista, Junnyan, for an interview. 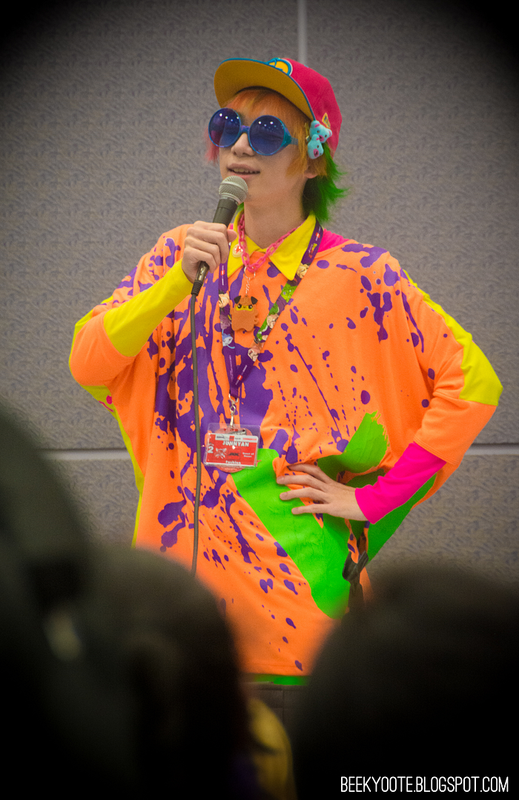 A guest of the Anime Expo 2015, Junnyan led the first “Harajuku Fashion Walk” in the US at AX (something he does in Harajuku, Japan and which caught Italy's attention) and hosted the much anticipated AX Fashion Show (wherein rock star drummer, Shinya of Dir En Grey, made his debut as a fashion model, donning h.NAOTO’s designs). He apparently may have started the convention a little unknown to the public (as he admitted to have experienced during his autograph session), but his stint in the Fashion Show, where he has not only showcased his eye catching attire, but also his delightful humor most likely boosted his popularity among fashionistas and non-fashionistas of the convention as seen during his panel after. At Day Zero, it was not at all hard to miss this person walking around in his bright yellow ensemble to match his multi-colored hair and his large strawberry for a bracelet. Read on to see what this colorful person is all about! VKH: We’ve seen your interview on YouTube and you said you grew up loving color. What attracts you to the bright colors you wear? Junnyan: Actually, for that video interview, I wanted to change my answer, so I’m happy you mentioned it. The thing about bright colors, and especially Harajuku fashion, is that because it’s so colorful and out there, people look at me or other people wearing it and thinks “you’re so open.” I don’t really have an answer, but what I think and what I think other people who wear Harajuku fashion think is that when you’re wearing a lot of those colors, you can hide your complexes. I think a lot of people who like Harajuku fashion actually have a lot of complexes about themselves and use the colors to hide it. Especially for Japanese people, they really don’t like showing their complexes and weaknesses, so it is their way of giving an idea to people they’re open. They don’t ask anything personal or private about them. For Japanese people, it’s trying to hide something dark, but for people overseas, who don’t understand the fashion, or found the fashion through Japan, they see it as a really good thing like a light. VKH: When styling your outfit, what kinds of things do you consider? Junnyan: Since I was meeting people and doing press today, I did think about my outfit a little bit, but normally, I don’t think about what I’ll wear or use a mirror. I pick everything randomly because I want it reflect myself. And I feel that if I look at a mirror and look at what other people are wearing, I wouldn’t be representing myself and I’d be representing somebody else. The most important thing is not thinking about it. VKH: Which brands do you find yourself wearing most often lately? Junnyan: It would be SUPER LOVERS and 6%DOKIDOKI, but I like certain pieces that they have and not like the brand as a whole. People buy this specific brand because they like the brand, but I wear it because I like a certain piece. There’s no one brand I really like, but most of my items come from SUPER LOVERS and 6%DOKIDOKI. VKH: Later this month will be the first-ever international Harajuku Fashion Day. Can you tell us your thoughts about it? 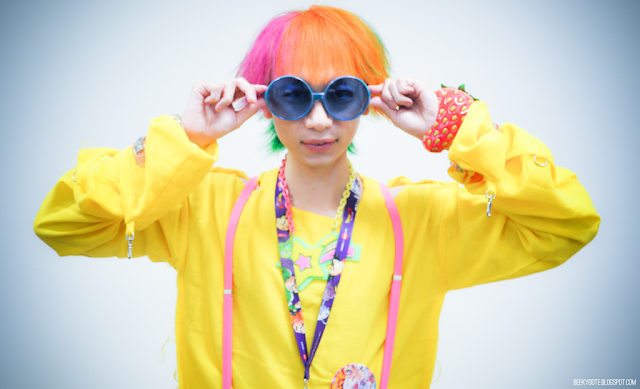 Junnyan: People from Italy contacted me about it first, but normally I think people should wear anything they want, but I also realize that not everyone overseas can be at Harajuku and they can’t participate in the Harajuku Fashion Walks because it happens about once a month. For everyone to do the Harajuku Fashion Day, I think it’s a good idea because I want everyone to have fun. It makes also makes people overseas seem really close to me even though they’re far away distance-wise just because they’re all doing the same thing. VKH: Do you plan on bringing the Fashion Walk to other countries, as well? Junnyan: I don’t know what specific countries like, but for the specific countries that have a lot of people that want something like that, then I definitely can do that for them. However, because it’s a very Japan-based thing and everyone can only speak Japanese, before I can reach out to other countries, they have to get over the language barrier. I don’t know what countries or how big the population that likes it enough to do an event. I want to find out where those people are, first. And I would do it anywhere as long as those people are there. VKH: There is a Harajuku Fashion Walk Gathering later this weekend, but it wouldn't be part of the official international event, correct? Junnyan: It is actually a part of it. It is an Anime Expo event that we are doing. VKH: We also heard that you are in your own band - is it still active? Is it important for fashion to reflect music? Junnyan: I am not doing the band right now, but I want to do it again. For me, the fashion is what inspires the music. But I also realize that it is the fashion that is inspired by music for most people. It depends on what they want to show. For me, if I’m going to do the band again, I want the visuals to be the main thing and the music to come after. But I also know there is a lot of fashion that is created based off the music. VKH: So, last question. Do you have a message for your fans in America who love your fashion? Junnyan: More than a message, I want my fans or anyone who will see me to remember my face and what I look like and to take care of me from now on. Because right now, I’m at the start and I need to get along with everyone. VKH: Thank you very much! Junnyan: Thanks so much! Arigato Gozaimasu~!